Back in 2016 or early 2017, I was talking with my buddy Brandon @PureStorage (find him via Twitter at @bdwill) about certifications. AWS came up, and he mentioned he had his AWS Solutions Architect Associate cert. This intrigued me, and I started to research it. I had always been interested in Public Cloud, and this seemed like the perfect opportunity to learn more while becoming certified at the same time. AWS if you don’t already know, is dominating the public cloud market. AWS Certs are some of the most desired certs within the IT market, and their popularity continues to grow alongside AWS. AWS is a leader in Public Cloud. They have more market share than all other cloud providers. It is a multibillion dollar company for Amazon, one they may split into a separate company in due time. Their value is expected to increase in the coming years. I truly believe we are on the cusp of a cloud revolution, one that will truly disrupt everything within the next 10 or 15 years. Artificial Intelligence, IoT, BlockChain, and Big Data will all transform what we know today. If you are overwhelmed now, just wait until the future! 🙂 I truly believe the old school ways of doing things will be crushed, and organizations will have to make big changes to stay relevant. Additionally, I wanted to ensure my skills stay relevant and be prepared for the next wave of innovation. Like many things in life, it’s all about the money, so either you embrace and disrupt or become disrupted. Finally, VMware on AWS is just starting to take off. Continued growth is expected as more business migrate their VMware workloads to VMware on AWS. Since I have a passion for both public cloud and VMware, this cert made sense. Towards the end of 2017 I got serious about taking the exam, and during the month of November I began to study. I spent about a whole month going through a training course on CBT Nuggets. The AWS Solutions Architect Associate exam can be misleading if you aren’t paying attention. I was one of those who didn’t pay attention. I thought that the exam would be easy since it was an “associate” exam. This is the “associate” exam I told myself, how hard could it be? The professional exam, I told myself, must be the hard one! This mindset (along with the lack of hands on labs) was detrimental to my success. I made a few notes and scheduled the exam for December 22nd, 2017 (in hindsight, don’t schedule exams before Christmas as there’s too much going on). I arrived at the testing center and checked in. Once the exam started, I realized I was in big trouble. I had failed to give this exam the respect it demands and I promptly suffered for it. My opinion of the exam was that it was the hardest exam I had ever taken. I truly believe it was one of the most humbling experiences I have ever been a part of. Hindsight: this exam was tough, and AWS has purposely made this exam hard to ensure the integrity of the test is maintained. With the sting of failure still fresh on my mind, I set out to attempt the exam again. I knew I didn’t want to give up that easily. The holiday season passed, and in January 2018 I purchased an AWS training course from a company called acloud guru. I prepared by going through the course completely and taking detailed notes during the entire course. Additionally, I went through and completed all required labs. Finally, I studied and read all of the suggested FAQs. Unsurprisingly, life happened and I go busy with the normal routines in life. One job change during that time and the next thing I know, several months passed. Reality: I wasn’t close to being ready and the results proved it. Not once, but twice did this exam humble me. I was not only frustrated, but embarrassed and crushed. How could I fail this exam twice I thought to myself? What do I do now? I was now at a crossroad. Do I give up and throw in the towel? Regroup and take it again? Some thought and a gut check later, I decided I would NEVER give up. In fact failing two times inspired me even more. I quickly realized it would take many months to prepare. The following resources were used to prepare this time. I admit the previous two times I didn’t prepare appropriately. This time I initiated Beast Mode and prepared as though my life depended on it. Jayendra’s Blog. This blog was instrumental in helping me fill in the gaps. It is truly one of the best resources in my opinion. Jayendra leaves no leaf unturned. I spent over two weeks before the exam going through reading and taking notes. 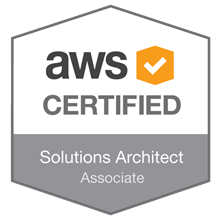 ACloudGuru’s course “AWS Certified Solutions Architect” – Ryan is awesome! The AWS Official Practice Test along with other various practice test. Mattias Anderson’s Cert Prep Course. This guy is a true genius. They say follow the steps of those who are successful, and this guy checks all the boxes. His course was very instrumental for me, since I had been unsuccessful two times. He gives practical advice on how to study and how to prepare. The main takeaway was the time and effort this go around. I easily spent a few hundred hours preparing (many late nights). Most of the time preparing was after my son was asleep, during my commutes and during breaks. This isn’t an exam you accidentally pass. You have to be deliberately intentional with a plan to study hard and make sacrifices. It would have been easy to make an excuse, say I was too tired, play on my phone, etc, but I pushed through with one goal in mind: Passing the exam. Additionally, I read all required documentation and created extensive notes from all of the above sources. Example: I read a FAQ section and then took my own notes, reading the content again and studying sections I didn’t fully understand. I also completed all labs. I did this with all content (course, FAQs, Blogs) until I had a full understanding. A lot of people will tell you the various training courses only prepare you for about 50% of the actual exam, which is true in my opinion. The rest of the preparation comes from good ole fashioned studying and practicing in the lab. I also typed some notes and printed some on paper to read them. This helped retain and solidify information rather than just reading or listening to it. The motivating factor driving me was that I didn’t want to quit as a failure. Too many times in this world, people quit. They give up too easily. You can argue they quit and give up before really even give it any true effort. I wanted to be an example to my young son that when I was faced with failure, I didn’t give up. I want to be able to let this be a life lesson for when he fails a test, doesn’t get a job, doesn’t make a team, etc. Additionally, I didn’t want to quit on something I was passionate about. I had spent months and countless hours preparing and I thought I was ready. It was December 2018 and I was about to book the exam, but after discussing with my wife we determined it would be best to push it out another month in order to not overdo it. I was pretty nervous since I had never taken this format before, and I wanted to make sure I gave myself enough time to prepare accordingly. Once I made my mind up, I scheduled the exam for January 19th, 2019. The morning started at 4AM. Bright flashes of lighting illuminated the windows with rumbles of thunder in the distant. I had only been sleeping for 2 hours since I was up until 2AM finalizing exam preparations. I quickly went back to sleep for 3 more hours. It was now close to 7AM, which meant time to get up. Exam day! The weather still wasn’t looking good. Wind, Rain and Tornado warnings made for an interesting drive to the exam center. Driving to the exam center in bad weather I thought to myself, is this a sign? What have I gotten myself into? This would be one more final hurdle I thought…as if I didn’t already have enough obstacles. I arrived safely and was able to get started with no issues (I was worried about power failure during the exam). This was the third time to take it, and it was a difficult exam; however, the months of preparation were for this very moment. The first ten questions were very tough as expected, but I didn’t get discouraged. When I got to a tough question, I made sure I relaxed and really focused on the question. This is what I prepared so hard for, I knew I could do it. While taking the exam I felt a lot more confident in the material and concepts. Series of questions were answered without doubt; however, towards the end of the exam I started to bog down a little. Spending over two hours taking a test can be mentally draining to say the least. I had just enough time to finish the exam and have about 15 minutes to review. I made sure not to overthink or change many answers. Every second of time was utilized until the exam ended. Hitting “End Exam” was very nerve-racking. What if I failed a third time? Regardless of what happened, I knew God, my friends and family were there for me. When I hit the “end exam now” button, I finally saw the words “Congratulations”. I couldn’t believe it, I was so relieved I had passed! I couldn’t have done it without the help and support from the good Lord, various people online, and the below individuals. Nick Korete’s experience. It was a lot like mine and very encouraging to know I wasn’t alone. Looking back the whole experience was something I will never soon forget. I not only pushed myself, but also learned a valuable lesson. Never give up! God doesn’t give up on us, so why should we give up on us? The lessons learned during this process are priceless and worth more than just obtaining the cert itself. Sure, the cert is a great professional accomplishment, but the life lessons gained are far more precious. The drive, desire and refusal to quit are all excellent life experiences that help teach us important lessons. I can rest easy knowing I am not a quitter. Regarding what’s next? I may continue down the AWS path and obtain more AWS Certs, but first I need to renew my VMware VCP Cert! Study over several months, ensuring you have time to really master the information (not just read). Break studying up into chunks. Take your time. Just because someone passes it the first time doesn’t mean you will. Create your own notes, understand the content fully. Have many sources of information. Write down your goals and constantly evaluate your progress. I also printed my failure letter in order to look at it everyday. This served as a daily reminder of my failure. This helped keep me motivated and on track. Never give up: Even if you aren’t successful continue in your efforts. Don’t be discouraged, many people are unsuccessful their first attempt! Dive deep into practice test questions that you get wrong. Read all of the documentation to fully understand the microservices and how hey interact with one another.